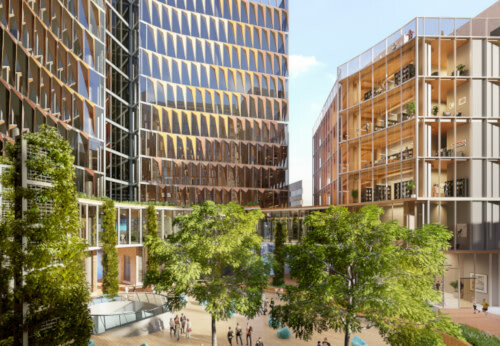 The University of Melbourne, in partnership with a consortium led by Lendlease, is developing Melbourne Connect, Australia’s leading innovation precinct. Melbourne Connect is an innovation ecosystem – a new model for progressive thinking within the STEM disciplines that places highest calibre university-led research, private enterprise, higher-degree students and elite thinkers within a singular purpose-built precinct. In our digital future, data-driven research will have immense potential to enrich our understanding of the world, unlock bold innovation and address the major social, economic and environmental challenges we will face on a global scale. Anchor University of Melbourne partner tenants include Science Gallery Melbourne, the Melbourne School of Engineering, and the Melbourne Entrepreneurial Centre. Melbourne Connect has been shortlisted at the 2018 World Architecture Festival Awards, and is scheduled to open late 2020. Join us as the principal creators and tenants of Melbourne Connect discuss the anatomy that underpins the success of innovation precincts. They will explore the role that architecture, design, engineering, development and partner tenants play in creating a successful purpose-built facility. Professor Mark Cassidy is the Dean of the Melbourne School of Engineering, one of Melbourne Connect's main tenants. He will speak on how MSE sees participation in a co-located model as advancing innovation in engineering and IT research. Rose Hiscock is the inaugural Director of Science Gallery Melbourne, an innovative new gallery dedicated to the collision of art and science. Rose will speak on the role that the arts play in the thriving innovation ecosystem that Melbourne Connect will create. Emma Woodhouse is Lendlease’s Project Director on Melbourne Connect. She will discuss the importance of place creation and curation at Melbourne Connect and how this important project is representative of the evolution of urban regeneration projects transforming into the innovation precincts of the future. Hazel Porter is a principal at Woods Bagot; lead design architects & master-planners of Melbourne Connect. Its architectural design is key to enabling the innovative methods of researching, teaching and exhibiting that Melbourne Connect will make possible. We look forward to welcoming you at this presentation of what will be a groundbreaking new development at the University and a major entrepreneurial asset for Melbourne.